1. Preheat the oven to 170°C, gas mark 3. Melt the butter, sugar and syrup together in a pan then remove from the heat. 2. Sieve in the plain flour, bicarbonate of soda and ground ginger then stir together to make a stiff dough. 3. Roll out on a lightly floured surface to 5mm thick. Cut out about 18-20 gingerbread men and bake on 2 large, lined baking trays for 10 minutes then remove from the oven and allow to cool. 4. 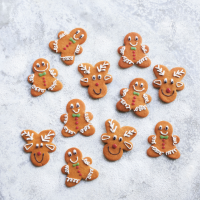 Decorate with icing to add eyes, nose and mouth (turn the gingerbread men upside down for the reindeer). This recipe was first published in November 2017.